BARCELONA, Spain--(BUSINESS WIRE)--At Mobile World Congress today, Vertiv and Telefónica announced a global, long-term partnership to boost energy savings through fit-for-purpose infrastructure solutions. Under the agreement, Vertiv will provide Energy Savings as a Service (ESaaS) across Telefónica’s core and access sites in Europe and America, covering all facets from initial site assessment to comprehensive maintenance services over the next ten years. Through this agreement, Vertiv experts will conduct energy audits and deliver wide-ranging assessment reports outlining projected KPIs as well as energy savings for each site. The reports comprise a series of recommendations for optimizing the performance, capacity, availability and efficiency of critical infrastructure, ultimately increasing energy savings. Vertiv will provide total support from consultancy and execution to 24/7 monitoring and maintenance services, requiring no capital expenditure (CAPEX) from the customer with Vertiv fully financing the project as part of the ESaaS contract. Vertiv and Telefónica have been business partners for more than 20 years, working closely together to deliver a broad range of innovative solutions to support Telefónica’s network sites across the world. 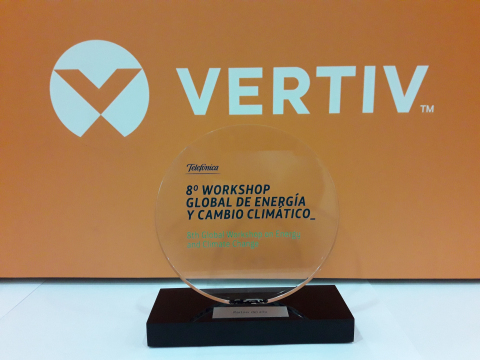 Vertiv was recently awarded by Telefónica as “Best Partner of the Year” at the 8th Global Workshop on Energy and Climate Change. 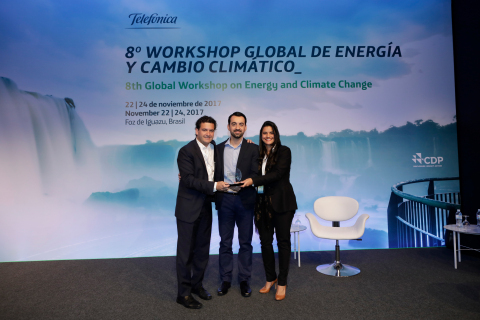 This accolade acknowledged Vertiv for the outstanding contribution to Telefónica’s Energy Efficiency Program, awarded by the GSMA with the Green Mobile Award in 2016. Throughout 2017 in particular, Vertiv delivered a series of energy-efficient infrastructure solutions, including thermal management equipment, AC and DC power units, and solar hybrid systems to support renewable energy sources. Vertiv state-of-the-art solutions have been replicated in several countries, giving Telefónica utmost performance and reliability on top of energy savings. By entering this new global agreement, Vertiv and Telefónica have aligned their vision for improving efficiency and enabling innovation across the globe. Find out more about ESaaS and Vertiv, and meet Giordano Albertazzi, president for Vertiv in Europe, Middle East and Africa (EMEA) at Mobile World Congress, Hall 2, Stand 2O41. Vertiv and Telefónica announced a global, long-term partnership to boost energy savings through fit-for-purpose infrastructure solutions.